An exhibition of watercolors captures a moment in American painting. Louis Comfort Tiffany, Algerian Shops, (1848–1933), 1872–1887. Opaque watercolor with brush and ink and red chalk on board. The Baltimore Museum of Art. Edward Hopper, Haskell’s House, 1924, watercolor over graphite on paperboard, 14 x 20 in. Charles Demuth, Still Life: Apples and Green Glass, 1925, watercolor and graphite on wove paper, 12 x 14 in. 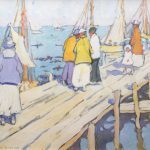 Jane Peterson, The Pier, Edgartown, c. 1915, gouache and charcoal on paper, 17 x 23 in. The opportunity to view fine watercolors is perhaps more rare than one might realize. Watercolor paintings are exceptionally light-sensitive and delicate, and thus the best examples in museum collections are shown in moderation. Their fragility, coupled with a long-held stigma that they were a lesser form of painting, makes it that watercolors too seldom have their moments in the sun. An ambitious exhibition, which opens at the Philadelphia Museum of Art this month (March 1), brings 170 exceptional examples of American watercolor from esteemed public and private collections momentarily out of the shadows. With the show running barely three months (it closes May 14), fans of the American painting tradition are advised not to blink and miss it. Titled “American Watercolor in the Age of Homer and Sargent,” the exhibition looks at the medium’s boom in popularity during the last few decades of the 19th century and the first few decades of the 20th. During this period, quite a few hobbies of the leisure class began their ascent to their eventual status as legitimate art forms (think photography). A popular pastime and commercial style before the Civil War, watercolor inhabited a seat at the art world’s kids’ table for much of the 19th century. It was even dismissed as a so-called “ladies’” medium. However, the inception of the American Watercolor Society in 1866 and the use of the medium by leading figures of the late 19th century—such as Thomas Moran, William T. Richards, and Thomas Eakins—established watercolor as an important format for depicting the American scene. 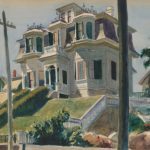 By the mid-20th century, such quintessential American artists as Edward Hopper, John Marin, Charles Burchfield, and Charles Demuth had utilized watercolor for a major part of their output. The exhibition uses the concurrent careers of Winslow Homer (1836–1910) and John Singer Sargent (1856–1925) as its timeline. Though they are both lauded for their work in other mediums, Homer and Sargent are arguably the most celebrated American watercolorists. Their lifetimes mirror the rise of watercolor’s popularity. Homer learned watercolor painting technique from his mother Henrietta Benson Homer. Henrietta, an accomplished amateur watercolor painter, will be represented with work in the PMA’s exhibition. 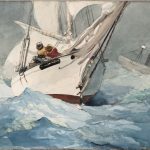 Homer, initially a successful commercial illustrator and later an eminent studio painter working in oil, began regularly incorporating watercolor into his practice after a summer trip to Gloucester, Mass., in 1873. Though initially met with critical derision (in response to a show in 1881 one critic wrote, “a child with an ink bottle could not have done worse”), Homer’s watercolors garnered popularity and sold steadily. The painter began to use watercolor as a primary medium, particularly while traveling. While spending two years (1881–82) in villages along the English coast, Homer worked almost exclusively in watercolor. This output was received favorably when the painter returned to New York. In the winter of 1884–85, during his first visit to the Bahamas, Homer painted some 30 watercolors, including A Garden in Nassau (1885), a highlight of the PAM’s show. The painting depicts a local boy on a sandy path looking toward an unseen house. The dwelling is blocked by a limestone wall so white one can almost feel it sizzling with midday heat. Large palm fronds are neatly detailed, while other examples of island fauna are expressed in fluid washes of color that dot the sandy path like puddles collecting rain. Homer, who is well known for his marine paintings, has several watercolor examples in the exhibition. 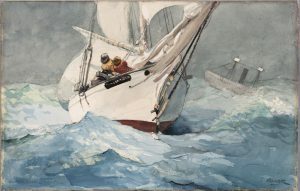 Diamond Shoal, a 1905 watercolor on paper, shows two sailors manning a sailboat in choppy seas, while a boat not far in the distance appears to sink. Here Homer uses watercolor as an effective device for depicting the elements—the gray, foggy sky seems thick with moisture, while the hostile waves teem with rabid white froth. Building a Smudge (1891), an earlier watercolor, is a more placid scene. The painting, which is one of some 85 watercolors Homer made in the Adirondacks between 1889 and 1895, shows to guides building a fire on an embankment near water’s edge. Like Homer, Sargent made many of his watercolors while traveling. The portrait painter, completed some 2,000 watercolors over the course of his career, in places like Florida and Corfu, the Middle East and Maine. Often taking on a playful or joyous quality, Sargent’s watercolors depicted nature scenes, architecture, native peoples, and friends. Of Sargent’s watercolors, his biographer Sir Evan Charteris wrote in 1927, “To live with Sargent’s water-colours is to live with sunshine captured and held.” Muddy Alligators, a 1917 watercolor in the PMA’s show, proves Charteris’ point. Sargent paints a scene of six alligators lounging in a swamp. The swamp water, which luminously reflects trees that grow above, and the alligators are both washed in the milky brown color of hot mud baking in the sun. Sargent, who often painted watercolors for personal amusement, completed this one as a diversion from another muddy task: painting a portrait of John D. Rockefeller at his winter house in Ormond Beach, Fla. Spanish Fountain, a watercolor from 1912, captures the yellow light of late afternoon hitting an ornate fountain. Of particular note are the tadpole-like strokes Sargent uses to suggest light reflecting off the water in fountain’s pool. The exhibition also has several tricks up its sleeve. One is a watercolor by Louis Comfort Tiffany—Algerian Shops (circa 1872–87). 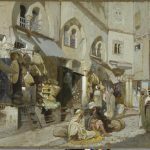 The designer’s foray into watercolor is a highly detailed street scene of a marketplace in old Algiers. Perhaps it’s a reach, but the way Tiffany depicts blocks of architectural elements on buildings, wares hanging from storefronts, and figures walking through the market seems reminiscent of the abstracted blocks of color on Tiffany lamps of the era. On the topic of glass, another piece in the show is John La Farge’s Peonies in a Breeze (1890), a watercolor which the artist would render in stained glass some nine years later. The stained-glass piece, Peonies in the Wind, which was reworked in 1908, is also on view. A plate made by Rookwood Pottery of Cincinnati in 1880 further illustrates versatility and popularity of watercolor at the time. The white glazed stoneware plate is decorated with fish and insects in an inky blue. Present also in the exhibition are examples of the new generation of painters who made watercolors their own. John Marin’s The Red Sun, Brooklyn Bridge (1922) is a view of the city and the Brooklyn Bridge’s architecture as seen from inside the bridge. It is watercolor at its most kinetic and most modernist. 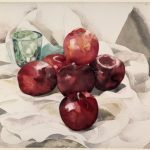 In Charles Demuth’s Still Life: Apples and Green Glass (1925), there are small bleeding passages in the red paint of the apples. These splotches of bled paint dance like light on the apple’s waxy skin. Haskell’s House, a 1924 watercolor by Edward Hopper, shows a large, white Victorian house on a hill from street view. Perhaps more than any other work in the show, Haskell’s House captures a view of America that has long since begun to fade.